Occator Crater, measuring 57 miles (92 kilometers) across and 2.5 miles (4 kilometers) deep, contains the brightest area on Ceres. This region has been the subject of intense interest since Dawn's approach to the dwarf planet in early 2015. Dawn's close-up view reveals a dome in a smooth-walled pit in the bright center of the crater. Numerous linear features and fractures crisscross the top and flanks of this dome. 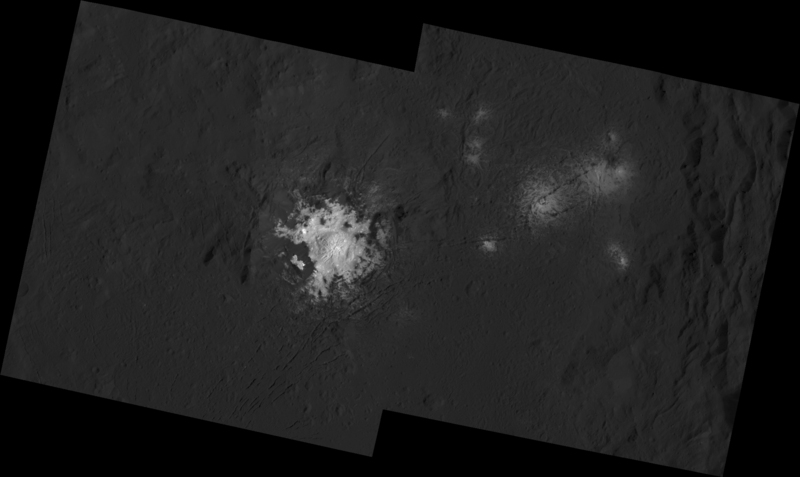 Prominent fractures also surround the dome and run through smaller, bright regions found within the crater. A separate figure shows the bright spots in a mosaic of two Dawn images taken using a shorter exposure time. The shorter exposure reveals details within the bright features that are overexposed, or nearly so, in the full mosaic. The images used to make these mosaics were taken from Dawn's low-altitude mapping orbit (LAMO), 240 miles (385 kilometers) above Ceres.